Marsha Kramer created the role of Wendy in Sandy Duncan’s PETER PAN on Broadway and for the national tour. She was Agnes Gooch to Juliet Prowse’s MAME at Harrah’s Tahoe and on a California tour. In the Los Angeles area her roles have included various Madames in THE GRAND TOUR with Jason Graae at the Colony Theatre, Alma Hix in THE MUSIC MAN at the Hollywood Bowl with Eric McCormack and Kristen Chenoweth, Lynne in the Pasadena Playhouse’s STEPPING OUT, Nina in THE COCKTAIL HOUR, 2nd Actress in THE DINING ROOM, Amy in COMPANY with Carol Burnett, Mickey in MY ONE AND ONLY, Susan in THE DESERT SONG, and the Usherette in BLAME IT ON THE MOVIES! Regionally she has appeared in THE SECRET GARDEN as Martha and in SHOWBOAT as Ellie. Her television credits include “Modern Family” recurring as Margaret, “NCIS”, “Dr. Ken”,“Eagleheart”, “General Hospital”, “Days of Our Lives”, “Malcolm in the Middle”, “State of Grace”, “Port Charles”, “Titus”, “Frasier”, “Ally McBeal”, “Touched By An Angel”, “Nothing Sacred”, “Love and War”, “Cheers”, “Life Goes On”, “Newhart”, and “The Bill Cosby Show” as well as the film “On Edge”. She has participated in numerous STAGE and PAWS benefits. A UCLA graduate, Marsha attended the Royal Academy of Dramatic Art in London and is the recipient of a Robby Award and four Los Angeles Drama-Logue Awards. 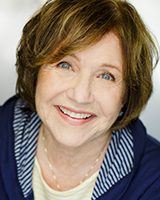 She is also a founding member of another play reading group, Bonnie Franklin’s Classic & Contemporary American Plays (CCAP), and a proud member of Actors’ Equity.